Cognitive behavioral therapy (CBT) is a form of talking therapy which can be used to treat people with a wide range of mental health problems. Therefore, negative and unrealistic thoughts can cause us distress and result in problems. When a person suffers with psychological distress, the way in which they interpret situations becomes skewed, which in turn has a negative impact on the actions they take. 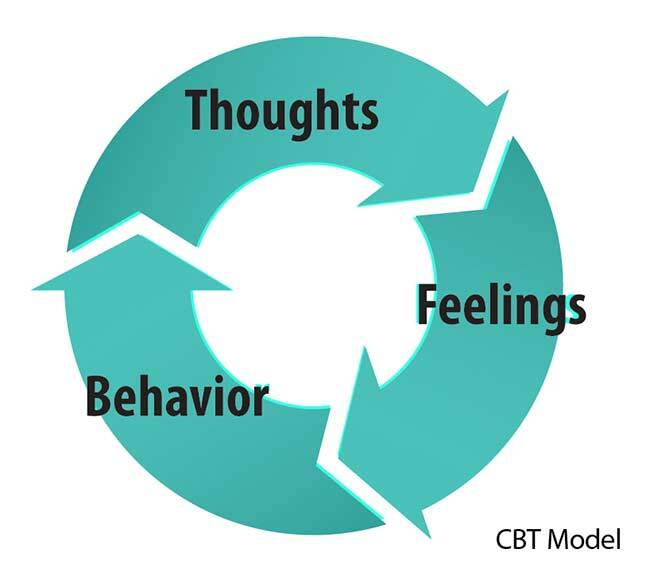 CBT aims to help people become aware of when they make negative interpretations, and of behavioral patterns which reinforce the distorted thinking. Cognitive therapy helps people to develop alternative ways of thinking and behaving which aims to reduce their psychological distress. Cognitive behavioral therapy is, in fact, an umbrella term for many different therapies that share some common elements. Two of the earliest forms of Cognitive behavioral Therapy were Rational Emotive Behavior Therapy (REBT), developed by Albert Ellis in the 1950s, and Cognitive Therapy, developed by Aaron T. Beck in the 1960s. • The cognitive approach believes that abnormality stems from faulty cognitions about others, our world and us. This faulty thinking may be through cognitive deficiencies (lack of planning) or cognitive distortions (processing information inaccurately). • These cognitions cause distortions in the way we see things; Ellis suggested it is through irrational thinking, while Beck proposed the cognitive triad. • We interact with the world through our mental representation of it. If our mental representations are inaccurate or our ways of reasoning are inadequate then our emotions and behavior may become disordered. The cognitive therapist teaches clients how to identify distorted cognitions through a process of evaluation. The clients learn to discriminate between their own thoughts and reality. They learn the influence that cognition has on their feelings, and they are taught to recognize observe and monitor their own thoughts. The behavior part of the therapy involves setting homework for the client to do (e.g. keeping a diary of thoughts). The therapist gives the client tasks that will help them challenge their own irrational beliefs. The idea is that the client identifies their own unhelpful beliefs and them proves them wrong. As a result, their beliefs begin to change. For example, someone who is anxious in social situations may be set a homework assignment to meet a friend at the pub for a drink. Rational Emotive Behavior Therapy (REBT) is a type cognitive therapy first used by Albert Ellis which focuses on resolving emotional and behavioral problems. The goal of the therapy is to change irrational beliefs to more rational ones. REBT encourages a person to identify their general and irrational beliefs (e.g. I must be perfect") and subsequently persuades the person challenge these false beliefs through reality testing. Albert Ellis (1957, 1962) proposes that each of us hold a unique set of assumptions about ourselves and our world that serve to guide us through life and determine our reactions to the various situations we encounter. A major aid in cognitive therapy is what Albert Ellis (1957) called the ABC Technique of Irrational Beliefs. The first three steps analyze the process by which a person has developed irrational beliefs and may be recorded in a three-column table. * A - Activating Event or objective situation. The first column records the objective situation, that is, an event that ultimately leads to some type of high emotional response or negative dysfunctional thinking. * B - Beliefs. In the second column, the client writes down the negative thoughts that occurred to them. * C - Consequence. The third column is for the negative feelings and dysfunctional behaviors that ensued. The negative thoughts of the second column are seen as a connecting bridge between the situation and the distressing feelings. The third column C is next explained by describing emotions or negative thoughts that the client thinks are caused by A. This could be anger, sorrow, anxiety, etc. Ellis believes that it is not the activating event (A) that causes negative emotional and behavioral consequences (C), but rather that a person interpret these events unrealistically and therefore has a irrational belief system (B) that helps cause the consequences (C). Gina is upset because she got a low mark on a math test. The Activating event, A, is that she failed her test. The Belief, B, is that she must have good grades or she is worthless. The Consequence, C, is that Gina feels depressed. After irrational beliefs have been identified, the therapist will often work with the client in challenging the negative thoughts on the basis of evidence from the client's experience by reframing it, meaning to re-interpret it in a more realistic light. This helps the client to develop more rational beliefs and healthy coping strategies. A therapist would help Gina realize that there is no evidence that she must have good grades to be worthwhile, or that getting bad grades is awful. She desires good grades, and it would be good to have them, but it hardly makes her worthless. If she realizes that getting bad grades is disappointing, but not awful, and that it means she is currently bad at math or at studying, but not as a person, she will feel sad or frustrated, but not depressed. The sadness and frustration are likely healthy negative emotions and may lead her to study harder from then on. Rational emotive behavior therapists have cited many studies in support of this approach. Most early studies were conducted on people with experimentally induced anxieties or non clinical problems such as mild fear of snakes (Kendall & Kriss, 1983). However, a number of recent studies have been done on actual clinical subjects and have also found that rational emotive behavior therapy (REBT) is often helpful (Lyons & Woods 1991). Beck’s (1967) system of therapy is similar to Ellis’s, but has been most widely used in cases of depression. Cognitive therapists help clients to recognize the negative thoughts and errors in logic that cause them to be depressed. The therapist also guides clients to question and challenge their dysfunctional thoughts, try out new interpretations, and ultimately apply alternative ways of thinking in their daily lives. Aaron Beck believes that a person’s reaction to specific upsetting thoughts may contribute to abnormality. As we confront the many situations that arise in life, both comforting and upsetting thoughts come into our heads. Beck calls these unbidden cognition’s automatic thoughts. When a person’s stream of automatic thoughts is very negative you would expect a person to become depressed (I’m never going to get this essay finished, my girlfriend fancies my best friend, I’m getting fat, I have no money, my parents hate me - have you ever felt like this?). Quite often these negative thoughts will persist even in the face of contrary evidence. The cognitive triad are three forms of negative (i.e helpless and critical) thinking that are typical of individuals with depression: namely negative thoughts about the self, the world and the future. These thoughts tended to be automatic in depressed people as they occurred spontaneously. As these three components interact, they interfere with normal cognitive processing, leading to impairments in perception, memory and problem solving with the person becoming obsessed with negative thoughts. 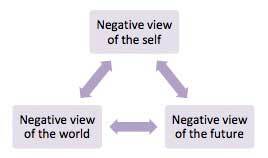 Beck believed that depression prone individuals develop a negative self-schema. They possess a set of beliefs and expectations about themselves that are essentially negative and pessimistic. Death of a parent or sibling. Parental rejection, criticism, overprotection, neglect or abuse. Bullying at school or exclusion from peer group. People with negative self schemas become prone to making logical errors in their thinking and they tend to focus selectively on certain aspects of a situation while ignoring equally relevant information. Beck (1967) identifies a number of illogical thinking processes (i.e. distortions of thought processes). These illogical thought patterns are self-defeating, and can cause great anxiety or depression for the individual. • Arbitrary interference: Drawing conclusions on the basis of sufficient or irrelevant evidence: for example, thinking you are worthless because an open air concert you were going to see has been rained off. • Selective abstraction: Focusing on a single aspect of a situation and ignoring others: E.g., you feel responsible for your team losing a football match even though you are just one of the players on the field. • Magnification: exaggerating the importance of undesirable events. E.g., if you scrape a bit of paint work on your car and, therefore, see yourself as totally awful driver. • Minimisation: underplaying the significance of an event. E.g., you get praised by your teachers for an excellent term’s work, but you see this as trivial. • Overgeneralization: drawing broad negative conclusions on the basis of a single insignificant event. E.g., you get a D for an exam when you normally get straight As and you, therefore, think you are stupid. • Personalisation: Attributing the negative feelings of others to yourself. E.g., your teacher looks really cross when he comes into the room, so he must be cross with you. Butler and Beck (2000) reviewed 14 meta-analyses investigating the effectiveness of Beck’s cognitive therapy and concluded that about 80% of adults benefited from the therapy. It was also found that the therapy was more successful than drug therapy and had a lower relapse rate, supporting the proposition that depression has a cognitive basis. This suggests that knowledge of the cognitive explanation can improve the quality of people’s lives. • Albert Ellis views the therapist as a teacher and does not think that a warm personal relationship with a client is essential. In contrast, Beck stresses the quality of the therapeutic relationship. • REBT is often highly directive, persuasive and confrontive. Beck places more emphasis on the client discovering misconceptions for themselves. • REBT uses different methods depending on the personality of the client, in Beck’s cognitive therapy, the method is based upon the particular disorder. 1. Model has great appeal because it focuses on human thought. Human cognitive abilities has been responsible for our many accomplishments so may also be responsible for our problems. 2. Cognitive theories lend themselves to testing. When experimental subjects are manipulated into adopting unpleasant assumptions or thought they became more anxious and depressed (Rimm & Litvak, 1969). 3. Many people with psychological disorders, particularly depressive , anxiety , and sexual disorders have been found to display maladaptive assumptions and thoughts (Beck et al., 1983). 4. Cognitive therapy has been very effective for treating depression (Hollon & Beck, 1994), and moderately effective for anxiety problems (Beck, 1993). 1. The precise role of cognitive processes is yet to be determined. It is not clear whether faulty cognitions are a cause of the psychopathology or a consequence of it. Lewinsohn (1981) studied a group of participants before any of them became depressed, and found that those who later became depressed were no more likely to have negative thoughts than those who did not develop depression. This suggests that hopeless and negative thinking may be the result of depression, rather than the cause of it. 2. The cognitive model is narrow in scope - thinking is just one part of human functioning, broader issues need to be addressed. 3. Ethical issues: RET is a directive therapy aimed at changing cognitions sometimes quite forcefully. For some, this may be considered an unethical approach.